Caprese pasta salad is so simple to make, and great for a picnic. 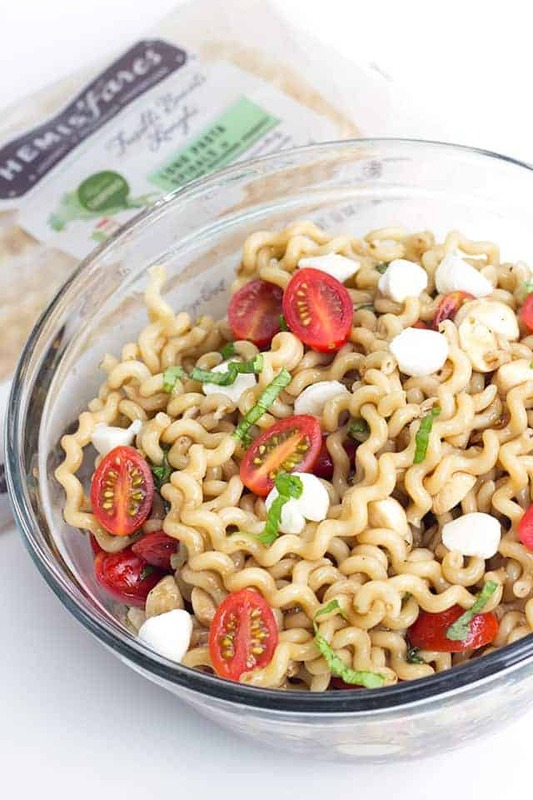 There are long pasta spirals, fresh mozzarella pearls, cherry tomatoes, and ribbons of basil all tossed in a balsamic vinaigrette dressing. 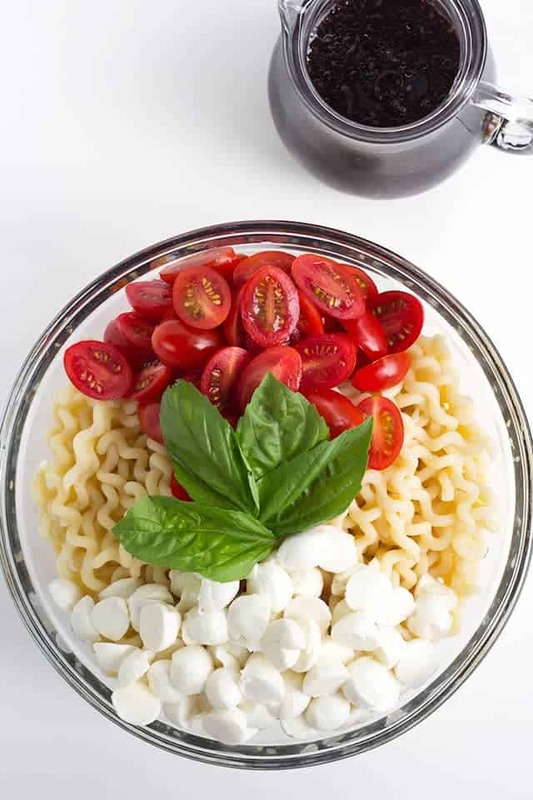 My favorite thing is to garnish the top the the caprese pasta salad with a sweet balsamic glaze. The longer the salad sits, the tastier it gets, too! 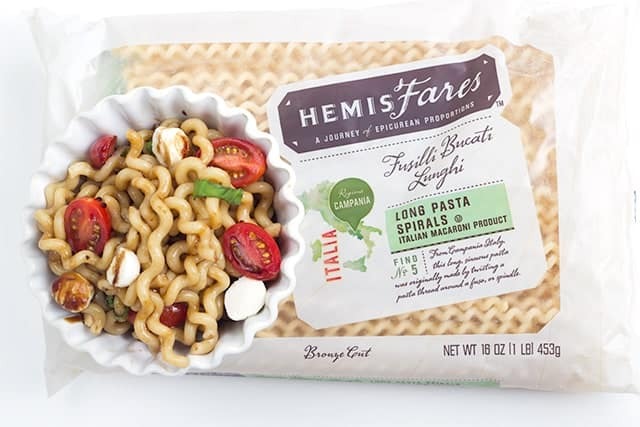 This is a sponsored post for HemisFares™ brand that is available exclusively at Kroger family of stores. All opinions are honest and 100% my own. 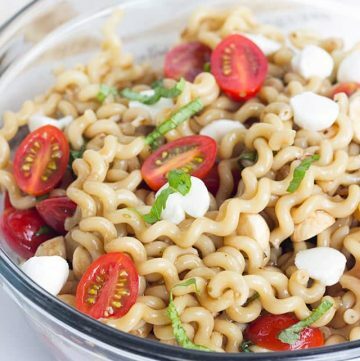 Summer is here and I’m switching things up with this easy caprese pasta salad recipe. Since I was a little girl, I’ve been a die-hard pasta salad lover, especially during the warm, summer months. I’ve always had the traditional pasta salad with the rotini noodles, loads of fresh veggies, Italian dressing and occasionally cheese. My mom tried to start adding the pepperoni, but how it discolors after a day or two sort of freaks me out, so that’s a no go. We’re stepping outside the box today though. Let’s first start with the HemisFares Fusilli Bucati Lunghi Find No. 5 which are the long pasta spirals. You can find it at Kroger, if you’re wondering. They grabbed my attention because for one, they’re really pretty and for two, they have holes in the center that will soak up more of our balsamic vinaigrette. You can either break it before adding it into the water or cook it whole. I’ll leave that up to you. Next we need to get some fresh mozzarella pearls to cut in half, cherry tomatoes to also cut in half, and some basil to either tear into pieces which would prevent the basil from bruising or cut it into pretty ribbons. I did the ribbons because I like my basil in small quantities. Otherwise, it’s just too overpowering for me. Let’s not forget our balsamic vinaigrette and balsamic vinegar to make our glaze. I was debating on trying to make my own vinaigrette dressing for this recipe, but I realized pretty quickly that I would much rather keep the recipe simple and buy it. If you make your own and want to use it, by all means, do it! 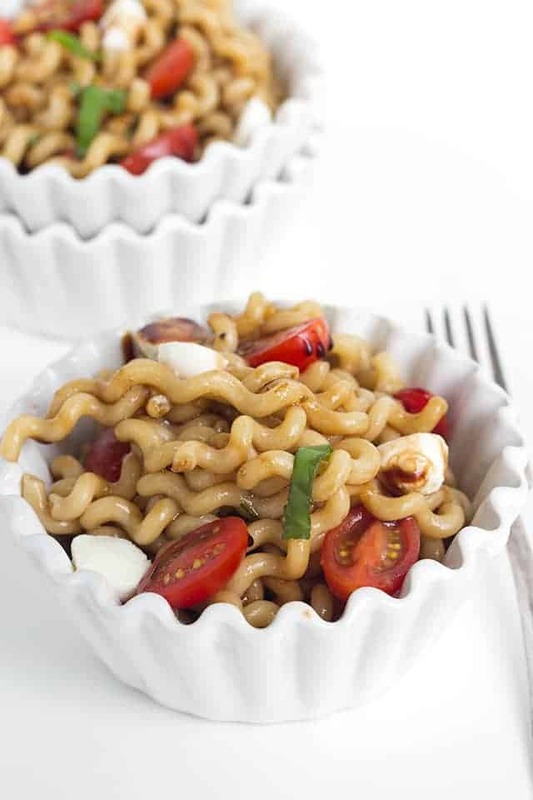 This caprese pasta salad is a winner for my son. He is so finicky about his food which is incredibly irritating. He doesn’t like Italian dressing with the red bits in it. He won’t eat any veggies other than cucumbers. 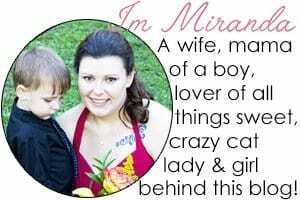 The list goes on and I totally blame his father for this, but guess what?! Neither of those issues are a concern with this caprese pasta salad recipe, which is a big, fat win. Woop woop! One last thing that I want to share. It’s a tip actually. As the caprese pasta salad sits, everything soaks up the balsamic dressing color and gets darker. To keep things looking fresh and bright, add a few fresh slices of tomatoes, mozzarella, and a little basil to the top of the salad after it’s all mixed in. That will immediately do the trick for you. Because this pasta salad recipe is perfect for a summer picnic, I suggest that you make a summery lemon dessert to serve as well. 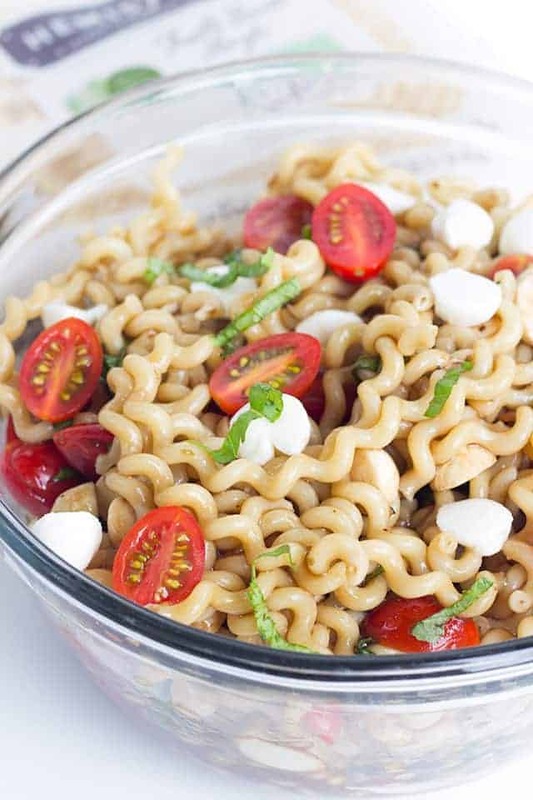 This caprese pasta salad is so simple to make and great for a picnic. There are long pasta spirals, fresh mozzarella pearls, cherry tomatoes, and ribbons of basil all tossed in a balsamic vinaigrette dressing. My favorite thing is to top the the pasta salad off with a sweet balsamic glaze. Add the balsamic vinegar into a small saucepan over medium heat. Let it simmer for 15 - 20 minutes until it becomes thick. Remove from the heat and let cool. It will reduce down to about 2 T. of balsamic glaze. Bring 4 quarts of water to a boil in a large saucepan. Either bring the noodles in half or leaving them whole, add them into the boiling water and boil for 12 - 14 minutes. I boiled mine for 14 minutes. Pour the noodles into a colander. Rinse with cold water until the noodles are no longer warm and drain. Slice the cherry tomatoes and mozzarella pearls in half. Set aside several pieces to add on top later. Add the rest in with the noodles. Cut the basil into ribbons or tear it up. Set aside a few pieces and add the rest into the bowl. Pour the balsamic vinaigrette dressing and glaze into the bowl with the pasta and stir until everything is coated. Add more or less dressing depending on your preference. Add the remaining slices of tomatoes, mozzarella, and bail to the top of the salad. Don't stir it in. This would be perfect for lunch! I love those pasta spirals, I’ve never seen any pasta shaped like that before.